Pass out these beautiful Wishes for Baby cards at the beginning of the shower, and allow guests to fill them out with their special wishes. Have them drop the cards into a bowl or box before they leave. 2. Your cards will be available to download immediately (in your Etsy account) after your order is placed! Print on your home printer or bring to your favorite print shop such as Staples, Office Depot, Kinko's etc. We recommend printing on bright white paper or white cardstock. Print as many as you need! 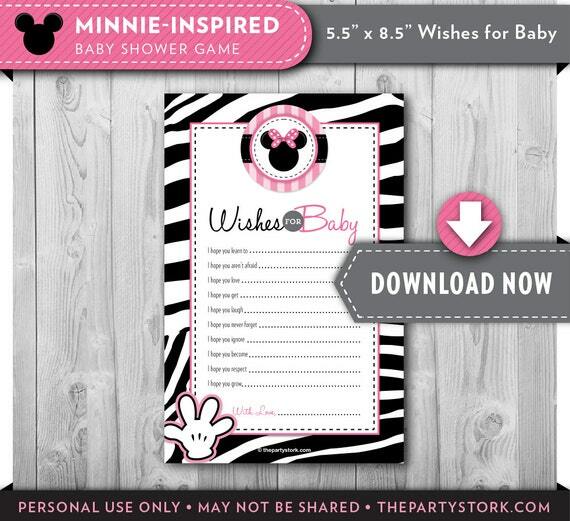 These wishes for baby cards or any of our printable baby shower games or party decorations are for your PERSONAL USE ONLY and cannot be resold, shared or given away. Please do not copy our designs. All of our products have been created by The Party Stork and its design team. ►COLOR VARIATIONS: Printouts from this file may vary slightly in color depending on your monitor and/or printer. ►CUSTOM ITEMS: Have your own Baby Shower theme ideas? We always welcome custom orders. We would love to create your item for you if there is something you do not see in our shop. Additional charges will apply. We are constantly adding new items so please check back with us often! ►The following Baby Shower printable games/cards are available in our store: Price is Right Game, Baby Predictions, Bingo Card, Book Raffle, Diaper Raffle, Pregnancy How Sweet it Is Candy Game, Old Wives Tales, What's in Your Purse Game, Wishes for Baby Cards, Word Scramble, Words of Advice and more. We have over 300 games available and more to come! ►The following printable Cowgirl Baby Shower decorations are available. Please check our shop or email us for details and pricing. ►THE PARTY STORK IS ON FACEBOOK! "Like" our page for exclusive offers, coupons and freebies only for fans! OR go to the main page in our shop at thepartystork.etsy.com and click on the Facebook icon.